This was one of the best hostels that we've stayed at. The staff was friendly and attentive, music and environment were both great and it was clean. One other huge plus: handtowels and shower mats! When we're back in Guatapé, I would not hesitate to stay here again. Suzie and Shawn are super attentive and nice hosts. They both traveld for a long time too and know what it means to search home in other places. So they give lots of good things for free: spices, oil, towels, they're livingroom to watch movies they provide etc. We really felt comfy. The location for us was way better than in the center, more nature and and amazing view all day long. Thank you two for having us!! Perfect! 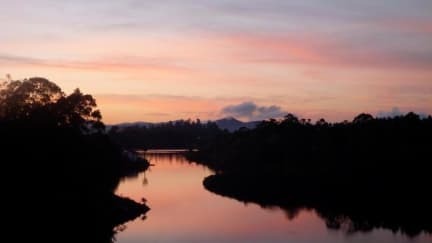 The best hostel in Guatapé. It is located next to the rock, so that is very convenient. With a motortaxi you are in the village within a couple of minutes or 30 minutes by foot. Lulu the dog is super cute and the owners really make you feel at home. Rooms were really nice and the bathroom was always super clean. Great hostel with really friendly, helpful hosts. Super close to El Penol. Has a small shop below and an epic kitchen (sharp knives, lots of herbs/spices, new pots and pans) so you can cook your own meals. Myself and my husband stayed here for two nights and we had such a lovely time. Sean and Suzy really make you feel like it’s your home and they are both so helpful. Our room was lovely and clean and had a nice view over the lake. There are great cooking facilities too and a little shop and restaurant next door. It’s a little bit outside of Guatapé but it’s very easy to get a bus in and it’s lovely and peaceful around the hostel. Would highly recommend! Shaun and Suzie are outstanding hosts with a unique guesthouse/hostel. Based far enough away from the town to escape the hustle, but not too far for it to cost you more than 2.5mil to get into (7 minute bus or 30 minute walk). 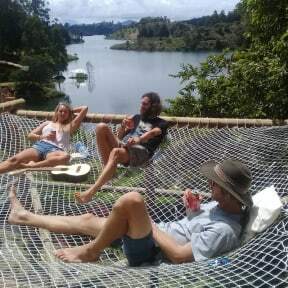 The place is a little more than basic - a few hammocks, a TV with movies, a spice rack and free kayaks for a dabble on the lake set behind the hostel. Nice for a couple for the cheapest private and chilled vibe.